Our latest recipe swap theme was fruit. Fruit in anything – sweet or savory. And I was very happy to receive Katie’s recipe for these delicious muffins. 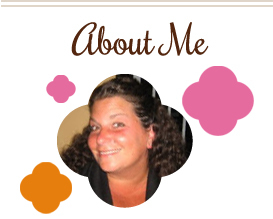 Be sure to check out her blog if you don’t already know about it…she’s got some great recipes! 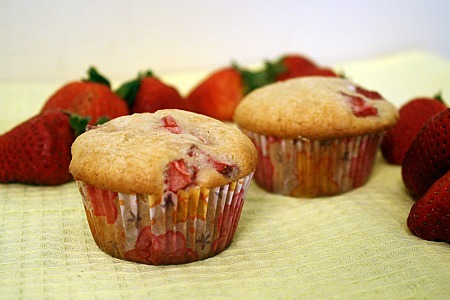 I LOVED these muffins…they were sweet but not too sweet, soft, fluffy and really tasty. You could really feel the creaminess from the cream cheese. And, talk about easy to make. I brought most of these to work and they were a huge hit with my coworkers. If you’re looking for a last minute addition to your Easter brunch, definitely make these! Preheat oven to 350 degrees. Cream together cream cheese, butter and sugar. Add eggs, milk and vanilla and mix until just combined. In another bowl, whisk together flour, baking powder, baking soda and salt. Add dry ingredients to mixing bowl and mix until just combined. Do not over mix. Batter will be thick, like cookie dough. Fold in strawberries. Spoon batter into paper lined muffin pans. Fill each cup about 3/4 high. Bake for about 20-25 minutes, until tops are golden. Cool on rack for at least 15 minutes. This entry was posted in berries, bread, breakfast, freezer friendly, fruit, muffin, QuickAndEasy, snacks. Bookmark the permalink. Your muffins are gorgeous! We went strawberry picking yesterday, so I am pretty sure these are getting made this weekend. Oh yum! Can’t wait to try these! I love muffins and these sound so easy. Definitely will have to find a good batch of strawberries and give these a whirl. Thanks! I am really excited to try these once strawberries are a bit more in season! These look like a muffin I would love. I’m so happy spring is here and strawberries have been getting cheaper and more delicious in the stores. I need to make these ASAP. They sound SOOOO good.